This hypertext multimedia work by the late master remixer Randy Adams is an homage to the World Wide Web. Adams describes his impetus “to create a hypertext[url] Web art work that pays homage to the World Wide Web and, on the other hand, pokes some fun at it” and “to utilize and interpret, exclusively, text and images found on the web.” To achieve this he embarked upon a constraint-based writing described in detail within the project, but best read after experiencing the work. 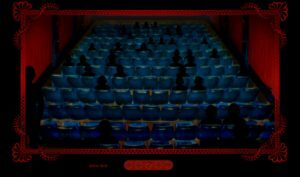 10:01 is a hypertext novel set in a movie theater during the ten minutes running up to the screening of the film. 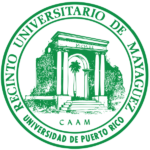 The text was published in 2005 in The Iowa Review Web. 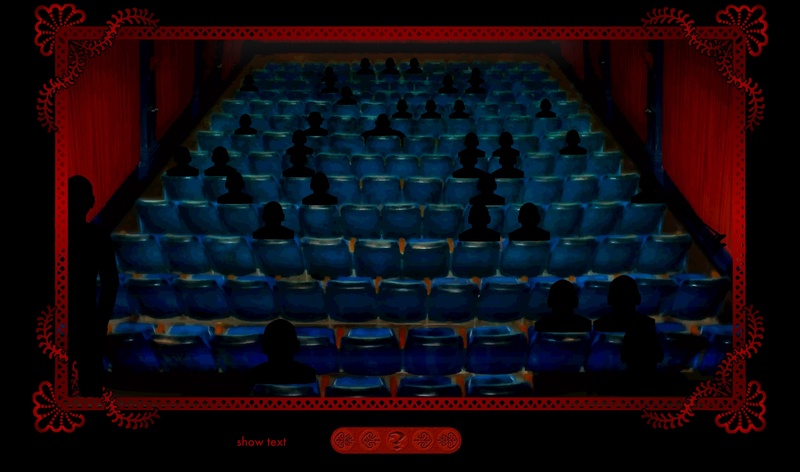 It consists of the image of a darkened cinema where black silhouettes sit in various rows. This image serves as one of the possible ways to navigate the text. 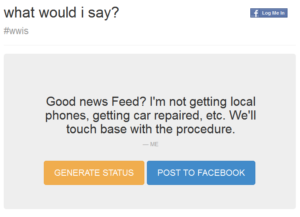 By clicking on a figure, we read from one to five texts, each of them advancing the narrative. The text can also be navigated by using the time bar, but the reader does not feel constrained to read it chronologically. Each of the characters has its own story, which is told by an omniscient narrator that has access to their innermost feelings, hopes, fears and desires. “Minicontos Coloridos” by Marcelo Spalding et al. Open “Minicontos Coloridos” by Marcelo Spalding, et. al. Minicontos Coloridos is a collaborative project conceived by Brazilian journalist, writer and teacher Marcelo Spalding in 2013. The short tales are structurally and conceptually associated with colors in a playful way. To access the stories, the reader should mix the primary RGB colors through a pull down menu available on the website in HTML which hosts the tales interface. The website offers three blending options for each of the three primary colors, totaling 27 short tales. Read more“Minicontos Coloridos” by Marcelo Spalding et al. 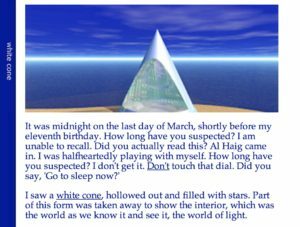 Michael Joyce’s “Twelve Blue” is a hypertext narrative told from different perspectives. It is possible to start reading at many different points and, as the stories unfold the reader discovers new meanings in old sequences. 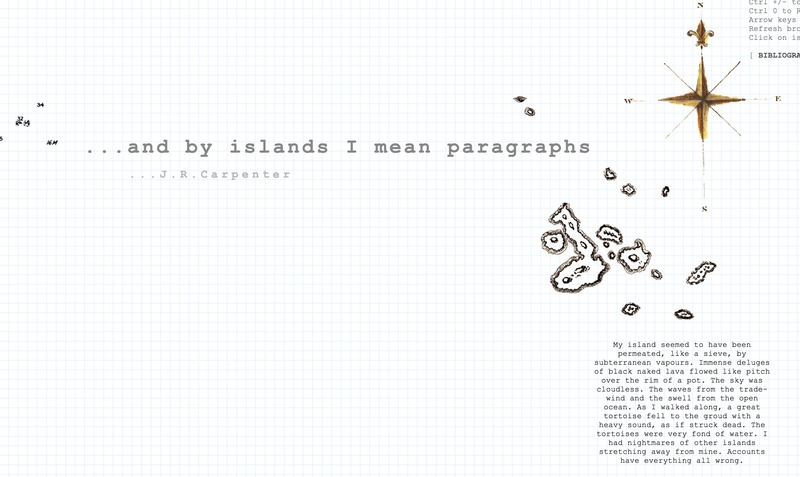 “…and by islands I mean paragraphs” is a delightful combination of computer generated poetry, mapping and the reworking of texts. The text is displayed as an interactive map that allows the reader to explore each island and the texts that they generate and regenerate. 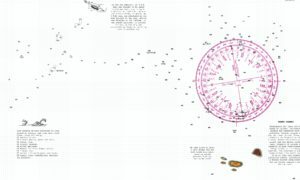 It alludes to an earlier piece, “Notes on the Voyage of Owl and Girl” (also reviewed in this site), which also employs a map to structure the text. In “…and by islands I mean paragraphs” the space is larger than the computer window, vast like an unknown sea, goes beyond the horizon we can distinguish. The reader is forced to explore this vastness in which text recreates itself or is altered by the reader’s own interaction with the islands. It is impossible not to wonder whether it likely that one might find the same island twice. However, a reader that submerges herself in this world ends up too involved in the mutability and the textual permutations and the search for possible repetition becomes less pressing. Their fluid compositions draw upon variable strings containing fragments of text harvested from a larger literary corpus – Deluze’s Desert Islands, Shakespeare’s The Tempest, Defoe’s Robinson Crusoe, Bishop’s Crusoe in England, Coetzee’s Foe, Ballard’s Concrete Island, Hakluyt’s Voyages and Discoveries, and lesser-known sources including an out-of-date guidebook to the Scottish Isles and an amalgam of accounts of the classical and possibly fictional island of Thule. Individually, each of these textual islands is a topic – from the Greek topos, meaning place. Collectively they constitute a topographical map of a sustained practice of reading and re-reading and writing and re-writing islands. The texts themselves, the islands, have different characters: they can be lyric, factual or a combination of both; but, independently of their own character they succeed in transporting the reader. 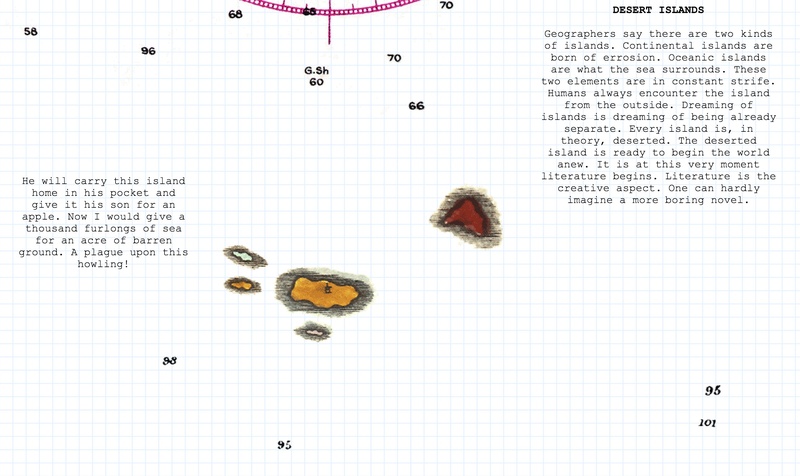 “…and by islands I mean paragraphs” is a truly magical piece of electronic literature: evocative and ethereal, without completely giving up the concrete (for which it used the grounding aspect of the map). It allows the reader to explore a world and to discover its wonders and surprises. If you have never encountered eliterature before, this is a wonderful piece to discover a whole new world. 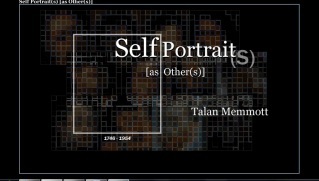 Talan Memmott’s 2003 work Self Portrait(s) [as Other(s)] situates itself within an art historical context by presumably introducing the reader to self-portraits of artists from between 1756 to 1954, allowing the reader to simply click through what might conventionally pass for a mundane educational presentation.